These translations of eighteen classical Chinese texts from the mid-ninth century (Tang dynasty) through the late nineteenth century (Qing dynasty) offer a comprehensive collection of primary sources focusing on gender issues in medieval and late imperial China. 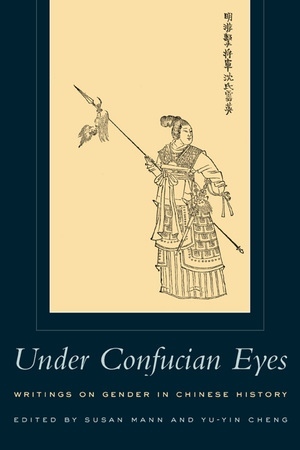 The book's title reflects the sometimes ironic relationship between Confucian viewpoints and women's visibility in Chinese historical documents. The texts, written by both men and women, show that Confucian values and scholarly practices produced a rich documentary record of women's lives. Susan Mann is Professor of History at the University of California, Davis, and author of Precious Records: Women in China's Long Eighteenth Century (1997). Yu-Yin Cheng is Assistant Professor of History at Marymount Manhattan College and author of A Chronological Biography of Lo Ju-fang (1515-1588): Poet, Philosopher, Activist (1995). This biography of an important Daoist female saint of the mid-ninth century chronicles her life from childhood through her spiritual self-cultivation, culminating in her ascension to heaven. The earliest documentary evidence of the legend of Miaoshan, this stone inscription shows how the local story of a Chinese princess became identified with a universal Buddhist deity, the Bodhisattva Guanyin. The excerpt from this classic appears opposite corresponding passages from the original Book of Filial Piety to highlight the differences gender makes in the text and its messages. These three funerary odes describe how the funeral tablets of Chen Liang’s mother’s family came to be in his care, how his mother and her sister decided to marry their children together, and how his sister sustained her natal household during a period of family calamity. Along with the commemorative biography that follows, they open important windows on domestic life and family values during the period following the fall of the Northern Song. This description of minority peoples from a Yuan dynasty official’s record of his experiences in Yunnan province illustrates how views of gender relations and especially sexual practices served as a measure of the level of civilization among non-Han populations. In these writings scholar and philosopher Luo Rufang celebrates women who pursue intellectual and philosophical interests. He also champions the virtue of motherly nurturance and love, which he considered as important as the central Confucian virtues of filial piety and brotherly respect. Composed in prison, these notes instruct Yang’s wife and sons how to get along without him. His foremost concerns are three: that his family not become the subject of ridicule, that his sons get along with one another, and that his wife—who had already proven herself the moral conscience of the family—not commit suicide. This autobiographical essay by the woman poet Ji Xian , with its powerful descriptions of dreams, visions, and personal illness, is unusually self-revelatory of the tensions between her personal religious desires and her obligations to her family. Having seen to it that both sons married capable and learned wives, Hangzhou poet Gu Ruopu, virtuous widow and matriarch of the Huang family, decided to divide the family property and establish separate households for them. In this letter Gu outlines her support for the Confucian ideal of familism, but admonishes her sons to recognize women’s indispensable roles in the male-centered kinship system. The large number of epistolary guides and collected letters published in the late Ming include models for letters to family members as well as a few examples of love letters and provide a unique view of the social universe of that period. The love letters translated here show how this genre can be read as a sort of epistolary fiction and raise questions about how people might have consulted letter-writing manuals for reasons beyond social etiquette. These short letters, written in the late sixteenth and early seventeenth centuries, reveal the erudition and wit as well as the spiritual and aesthetic sensibilities of highly educated upper-class women. These short selections from the works of one of the earliest anthologists of women’s writings display the extraordinary range and breadth of her learning, while revealing her personal, aesthetic, and scholarly sensibilities. The ghost story, authored by men and narrated from the male point of view, is one of the privileged spaces in Chinese literature for exploring fantasies of gender and sexuality. Such tales often involve a passionate affair between a young scholar and a beautiful female ghost who possesses a surprising degree of corporeality. The two late imperial tales translated here share two related themes: the power of love to triumph over death and the cosmic power of male generativity. These biographies by one of the most distinguished scholars of the Qing period breathe life into views of women that are sometimes dismissed as mere conventions or stereotypes. In both texts we see, through men’s eyes, how women took responsibility for setting the standards to measure and criticize men’s behavior. These poems about women at work, written mostly by men and spanning the dynasties from Tang through Qing, display the varied meanings of women’s work in the poetic imagery of elite writers and point to the ways in which women as literary subjects supplied a ceaseless range of possibilities for inventive poets over time. The poems also show the subtle relationship between poetry as social criticism and poetry as aesthetic performance in the culture of the late imperial elite. In this dramatic tableau the playwright casts herself as the sole speaker. She poses before a portrait of herself cross-dressed as a male scholar and sings to the portrait a sequence of lyrics describing her frustrations as a woman of talent. The text concludes that none but her cross-dressed self-image is a match for the writer herself. Hangzhou poet and official Chen Wenshu, a noted patron of female writers, wrote a collection of poems celebrating this work. During his eight-month stay in Taiwan in 1847 Ding Shaoyi wrote the Brief Record, which treats sixteen topics, among them: taxes, schools, coastal defense, local products, "savage" villages, "savage" customs, and marvels. When he returned to Taiwan in 1871 he appended new material to each item in his original account. The passage translated here is Ding’s 1871 supplement to his original entry titled "Savage Customs." This anonymous bilingual text, in Manchu and Chinese, reflects the complex ethnic picture in late imperial China, particularly in and around Beijing. Youth books were a form of oral performance very popular in the Qing capital. In this particular one, the story is told of a hapless Manchu bannerman and his shrewish Han Chinese wife who run afoul of a pot of feisty crabs.